Your child is learning about the most important part of the body—the brain! The brain is the control center for the entire body. It controls everything a person does. This module teaches children about the five major parts of the brain and their functions. Cerebral Cortex: right and left hemispheres The cerebral cortex, comprised of the right and left hemispheres, is responsible for artistic expression, understanding relationships in space, mathematical ability, problem solving, and comparing information needed to make decisions. It is also the brain’s center of language. Cerebellum The cerebellum controls posture, movement, and the sense of balance. Playing ball, picking up objects, and playing musical instruments are just a few of the activities that fall under its domain. Brain Stem The brain stem controls sleep, awakening, dreaming, heart rate,respiration, and blood pressure. The brain stem also controls body temperature; simple reflexes, such as coughing and sneezing; and digestion. Limbic System The limbic system is responsible for learning, memory, and emotional behavior. The limbic system is greatly affected by drugs. Positron Emission Tomography (PET) – uses radioactive substances linked to sugar to show which parts of the brain are using the most energy. These are the brain areas that are most active. Areas of the brain with the highest radioactivity will look bright red, and therefore are working hard. Areas that have little activity will be dark blue. Single Photon Emission Computed Tomography (SPECT) – uses radioactive material to show which parts of the brain are using energy and are most active. SPECT produces images that are less detailed than PET, but SPECT techniques are less expensive and more accessible than PET. Magnetic Resonance Imaging (MRI) – uses radio frequency signals produced in a strong magnetic field to create an image of the brain. These images provide more details about brain structure, but they don’t show specific functions like SPECT and PET scans. This activity aligns with two standards identified in the National Science Education Standards: unifying concepts and processes, and science and technology. The activity explains the key concept that the brain is part of a larger system—the human body—and that both systems work together to enable people to function. Students also learn about PET, SPECT, and MRI and how they are used to further knowledge about the brain. Ask your child what he or she learned about the brain. See how many parts he or she remembers and can identify. Act out different activities and have your child guess which part of the brain is being used. Then ask your child to draw a picture of the brain and label it. 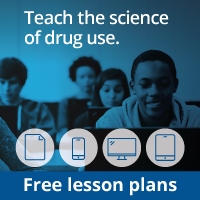 This Web site contains information about drug abuse and a section designed specifically for parents, teachers, and students. Publications and other materials are available free of charge at drugpubs.drugabuse.gov. This Web site contains information on the brain and neurotransmission, activities, experiments, pictures, and other resources for students and educators. Phineas Gage: A Gruesome but True Story About Brain Science. [Fleischman, J.] Boston, MA: Houghton Mifflin Co., 2002. Written for ages 9 through 12, this book tells the story of a railroad employee who experienced personality changes after a 13-pound iron rod shot through his brain. Focus on Drugs and the Brain. [Friedman, D.] Frederick, MD: Twenty-First Century Books, 1990. Part of the “Drug-Alert Book” series; gives a good overview of the brain, neurotransmission, effects of drugs on the brain, and addiction. Big Head! A Book About Your Brain and Your Head. [Rowan, P.] New York: Alfred A. Knopf, 1998. Gives an overview of the different parts of the brain; includes detailed color pictures and transparencies.